A recent study by Laura Bottazzi et al. at the University of Bologna, Italy confirmed a pretty obvious fact of international business. Far from being the rational agents of standard economics, objectively focusing on those countries offering the best return on their investments, international financiers are in fact heavily influenced by national stereotypes. A Dutch venture capital fund, for instance, is far likelier to invest in a German company than a Spanish one. This is due in large part to the greater trust and cultural affinity that exists between the Dutch and Germans, rather than any specifically economic reason. 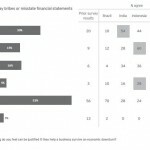 As a country suffering from a severe reputational deficit, even relative to most other major emerging markets, these findings should be of great interest to Russia’s leaders – whose lack of PR finesse is simply astounding (any number of specific examples can be given, but suffice to say that there is still no effective Russia lobby in Washington DC). Medvedev seems to be operating under the delusion that publicly lambasting Russia’s institutions – e.g. his famous dismissal of the entire judicial system by portraying Russia’s environment as one of “legal nihilism” – will somehow help resolve those problems that do exist, enhance Russia’s image, and woo foreign investors. Nothing can be further from the truth. Progress in institutional improvement has been rapid the past few years. A third of the most senior police officers were recently dismissed; international anti-corruption agreements have been signed up to; according to a recent government report, the incidence of bribes has fallen, while their average size has grown (which indicates corruption has become riskier, e.g. thanks to measures such as greater fines for bribery). 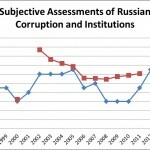 This is reflected in Russia’s score on the Global Integrity Report, which attempts to measure objective levels of corruption, rose from 63/100 in 2006 to 69/100 in 2008 and 71/100 in 2010. The latest figures aren’t much worse than what is found for East-Central European countries now commonly regarded as “civilized”, such as Hungary or the Czech Republic. However, on Transparency International’s Corruption Perceptions Index, which is (by definition) a very subjective measure of corruption, Russia continues to plummet relentlessly, from 2.5/10 in 2007 to just 2.1/10 by 2010, putting it below Third World failed states like Zimbabwe or Yemen. So under Medvedev the international perception (in the media, think-tanks, etc) is that corruption and institutional failure have proceeded apace even as most objective indicators hinted that developments were moving in the opposite direction. This widening gap between perception and reality isn’t only a vast and growing PR failure, but it also hurts the Russian economy and is one that in large part Medvedev is responsible for on account of his intemperate rhetoric. Speaking in black and white terms of “legal nihilism” is easy (but just a bit questionable, given that Russian citizens win the majority of cases against the state) but doesn’t solve any problems that do exist. In the process, instead of lauding Russia for its openness and willingness to acknowledge problems, the exact opposite effect is created in which the Western media and other opinion-makers quote the President’s own words to reinforce its stereotype as a lawless jungle that out be shunned by investors. And they seem to be listening; capital outflow from Russia has been accelerating in recent months, despite a recovery in economic output and if anything a further acceleration in reforms. Of course, even if we accept that Russia is full of legal nihilism, would it be in its interests to propagandize that fact to the world? Of course not. Only an idealist or an idiot would think otherwise. 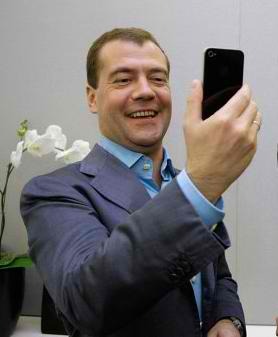 Apart from all that Medvedev has done very little to promote Russia, and a lot to undermine it. I’m not just speaking of stunts like his child-like adoration of an iPhone from Steve Jobs (thus earning him the name Dima iPhonechik on Runet), or attacking Putin’s germane criticism of the West for their crusader aggression against Libya (thus losing it many billions of dollars in economic contracts with Gadaffi for no gain, as the rebels have made it clear that once they take power everything will be re-awarded to French and British firms), or ordering European planes for his Presidential fleet at a time when the indigenous Russian Sukhoi Superjet is coming into service, or asking the government to draft a program for the support of education of Russian students in leading international universities (how many of them will actually return to Russia and repay the state? why subsidize Oxbridge or the Ivy League when RUSSIAN universities could do with a bit more funding themselves??? ), or his ridiculous prancing to American Boy (in stark contrast to Putin who sticks with patriotic songs like Where Does the Motherland Begin? and of good taste like Blueberry Hill). DAM, why don’t you go back to being a high school DJ? He is in thrall to the Russian liberal worldview that hates Russia and worships Western ideas taken to extremes not seen in their own countries. For instance, take DAM’s bizarre recent campaign to transform economic criminality into a respectable profession. The proposed abolition of pre-trial detention means that economic criminals will now simply be able to take an extended holiday in London, even in those cases the state still has the backbone to prosecute. This is accompanied by a renewed ideological drive of the Medvedev liberals to privatize Russian state companies, in a quest – conscious or not – to transform Russia into a full-fledged oligarchy where the moneyed call all the shots. Thus, going from a situation in which the state – at least minimally beholden to its electorate – heavily influences the oligarchs, to one where the oligarchs (unaccountable to anyone whatsoever, as evidenced by Medvedev-friendly Prokhorov’s push for a 60-hour workweek) control the state and oppress everyone else with their sick neoliberal ideology. Things are now clear. 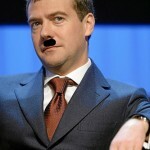 Medvedev is a naive fool at best, or simply an enemy of Russia. In any case, he is patently unfit for the Presidential office. One way or another, through Putin’s intervention or the ballot box or the pitchfork, he has to be ousted from the Kremlin if the Russian people value their sovereignty. While I did (and still do) predict the likeliest outcome is a continuation of the DAM Presidency from 2012, there has rarely been a time when I more earnestly wished to be proven wrong.